Gross Sales - Total value of net goods movement including VAT. Includes value of non coded sales for which no cost value can be established. Sales VAT - VAT value of net goods movement. Accrued Liabilities - Difference between the sum of any account credits, deposits/order payments taken, and vouchers & credit notes issued and the sum of any account debits, deposits/order payments redeemed, vouchers & credit notes redeemed. Misc Inc & Exp - Difference between any miscellaneous incomes and expenses. The report requires a date range to be specified, and due to the calculations required above it may take time to load the report, especially over a large date range. 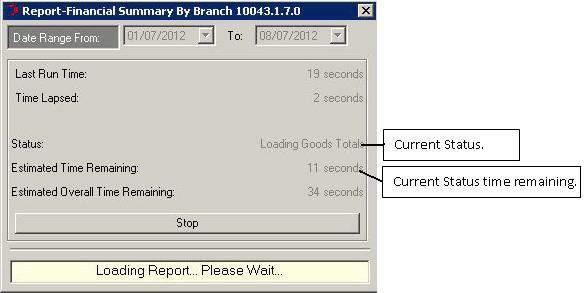 For this reason there are estimated times displayed on screen to give an idea of how long the report will take to load. When the date range has been specified and the “OK” button is pressed, the status will change periodically to display what is being calculated and the estimated time it will take to complete. There is also an overall time remaining figure which is a sum of all calculation time estimates. These times may adjust throughout the calculation process to give a more accurate estimated time remaining. You may stop the report from loading at any point by pressing the “Stop” button. However, if you choose to re load the report it will re calculate the report from the beginning and not from the previous point.